A local board was formed for Town ward in 1882 and was extended to cover Ripple ward in 1885. In 1888 Barking parish was reduced in size, to match the area of the local board, as the Chadwell and Great Ilford wards formed a new parish of Ilford. 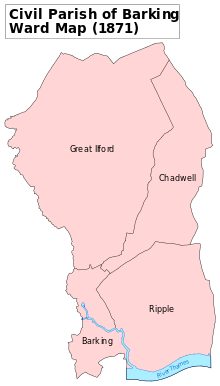 In 1894 the area of the local board became the Barking Town urban district of Essex, as part of the Local Government Act 1894, and the Ilford parish became the Ilford Urban District. The district gained the status of municipal borough in 1931 and was renamed Barking. The borough ran its own tram services, Barking Town Urban District Council Light Railways, until they became the responsibility of the London Passenger Transport Board in 1933. The borough bordered East Ham to the west, Ilford to the north and Dagenham to the east. In the south the borough bordered the River Thames, with the Metropolitan Borough of Woolwich in the County of London to the south. There was also a land boundary as the eastern part of the North Woolwich exclave was surrounded by Barking on three sides. Since the building of the Becontree estate in the 1920s across the three districts of Ilford, Barking and Dagenham, there had been periodic discussion and review of the local government arrangements in the area. The districts were all considered to form part of the Greater London conurbation and in 1957 formed part of the review area of the Royal Commission on Local Government in Greater London. The 1960 report of the commission recommended the union of Barking and Dagenham as a single London borough. Following the review, in 1965 the London Government Act 1963 abolished the municipal boroughs of Barking and Dagenham, and transferred their former area from Essex to Greater London, to form the London Borough of Barking. The section of Barking west of the River Roding around Beckton became part of the London Borough of Newham. ^ a b Great Britain Historical GIS / University of Portsmouth, Barking UD/MB (historic map). Retrieved 2008-08-18. ^ Great Britain Historical GIS / University of Portsmouth, Barking parish (historic map). Retrieved 2008-08-18. This page was last edited on 2 August 2018, at 11:55 (UTC).